"London Northwestern Railway" and "West Midlands Railway" redirect here. For the historical train company, see London and North Western Railway. For other uses, see West Midlands Railway (disambiguation). West Midlands Trains (WMT) is a train operating company in the United Kingdom that operates passenger trains on the West Midlands franchise between London and stations in the English Midlands. It is owned by a consortium of three companies: Abellio, JR East and Mitsui. West Midlands Trains took over the franchise on 10 December 2017 and operates trains under two distinct brand names, London Northwestern Railway and West Midlands Railway. Each brand has a unique livery. In April 2016, the Department for Transport (DfT) announced the shortlist of bidders for the West Midlands franchise, comprising the incumbent operator Govia, MTR Corporation, and West Midlands Trains: a consortium of Abellio (70%), JR East (15%) and Mitsui (15%). In July 2016, MTR Corporation withdrew from the bidding process. The invitation to tender was issued in August 2016. In August 2017, the West Midlands Trains consortium was awarded the franchise. It took over from London Midland on 10 December 2017. The franchise is scheduled to run until March 2026. Unlike the previous London Midland franchise, which was solely accountable to the DfT, West Midlands will also be accountable for services that operate wholly within the West Midlands region to West Midlands Rail Executive, a group of 16 local authorities. However, the DfT will still need to approve any changes West Midlands Rail wish to make until the franchise is relet, by which time West Midlands Rail will award the future franchise for services wholly within the West Midlands region. WMT services are split into two businesses which operate under two distinct sub-brands. Longer-distance train services running on the West Coast Main Line, including those running to/from London Euston, Liverpool Lime Street and Crewe operate under the London Northwestern brand. This name was chosen in tribute to the former London & North Western Railway (LNWR), the company that operated services on the route between 1846 and 1922. Branding of trains and associated publicity use a green colour scheme with a logo composed of the letters L, N and W.
Services running in Birmingham and the West Midlands region — previously operated by under the London Midland City brand — are operated by WMT under the West Midlands Railway brand. These services bear an orange and grey colour scheme and are branded with a hexagonal "WM" monogram. WMT have chosen to operate these services as a distinct business unit in order to facilitate a possible future devolution of these services from the national DfT to the West Midlands Combined Authority. West Midlands Trains operate all train services previously run by London Midland. Trains operate under one of the company's two brand names depending on route. Services on the short Stourbridge Town branch line are run by the independent operator Pre Metro Operations, who operate services on behalf of WMT under the West Midlands Railway brand name. Most trains run to Worcester Shrub Hill, then reverse to continue to Foregate Street. Some irregular off-peak trains either terminate at Shrub Hill or run through to Foregate Street, avoiding Shrub Hill. A few trains continue to Great Malvern. extension of the Birmingham to Wolverhampton service to Crewe via Stoke-on-Trent. This will replace the London Euston to Crewe service via Stoke-on-Trent that will operate directly from Stafford to Crewe via the West Coast Main Line. The change of this service has angered councillors in Staffordshire as to the loss of the direct service (although Virgin Trains West Coast will continue to operate a London-bound service through Stoke-on-Trent). The change of service is necessitated by West Midlands Trains increasing the number of carriages up to twelve in peak hours, which makes stopping at Alsager, Stone and Kidsgrove impossible due to their platform lengths being unable to take 12-car trains. West Midlands Rail have since stated these stations will retain a direct service to London taking a slower route via Birmingham and Northampton. reintroduction of calls at Barlaston and therefore closure of Wedgwood. This will mean the end of the long standing Rail Replacement Bus service. From 10 December 2017, the Stafford – Stoke-on-Trent Rail Replacement Bus was cut back to run only between Stoke-on-Trent & Norton Bridge, via Wedgwood, Barlaston and Stone. WMT inherited a fleet of Class 139, 150, 153, 170, 172, 319, 323 and 350 units from London Midland, but as the newer units come on stream, some will be returned to the leasing companies that own them. 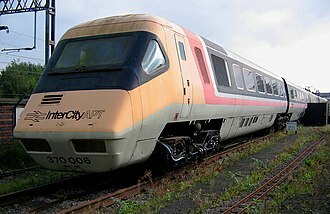 West Midlands Trains has ordered 26 brand new CAF Civity diesel multiple units (80 carriages) and 81 electric multiple units based on Bombardier Transportation's Aventra platform (333 carriages), giving a total of 107 brand new trains for the operator. All of the new trains are set to be delivered to West Midlands Trains between 2020 and 2021. In addition to the new rolling stock on order, eight two-car Class 172 units will transfer to West Midlands Trains from London Overground, whilst the ten Class 350/4 units currently operated by TransPennine Express are also set to join the fleet. West Midlands Trains are also the first operator of the Class 230, a new class of diesel electric multiple unit that are upcycled London Underground D78 Stock. WMT have placed an order for three two-car units, which are starting to be used on The Marston Vale Line. In October 2017, details were announced of the first group of planned new rolling stock for West Midlands Trains. Further details became available shortly afterwards. Wikimedia Commons has media related to West Midlands Trains. London Midland – Former West Midlands franchise operator. ^ Operated by Pre Metro Operations on behalf of West Midlands Trains; branded as a West Midlands Railway service. ^ "West Midlands Trains (LM)". nationalrail.co.uk. Retrieved 2 June 2018. ^ Lea, Robert (11 August 2017). "Southern operator comes off the rails in West Midlands". The Times (72299). p. 37. ^ "London Midland loses West Midlands rail franchise". BBC News. 10 August 2017. Retrieved 10 August 2017. ^ Jones, Tamlyn (10 August 2017). "£1 billion rail investment as London Midland loses franchise". Birmingham Mail. Retrieved 10 August 2017. ^ Witherow, John, ed. (27 October 2017). "Railway great returns". The Times (72365). p. 54. ISSN 0140-0460. ^ West Midlands Railway (26 July 2018). "Up to three extra trains per hour for Bromsgrove". Retrieved 30 July 2018. ^ Harris, Jordan (19 August 2017). "Staffordshire forgotten in rail shake-up". Express & Star. Retrieved 19 August 2017. ^ Clinnick, Richard (25 October 2017). "£680m deals agreed for new West Midlands trains". Rail Magazine. No. 838. Peterborough: Bauer Media. p. 12. ISSN 0953-4563. ^ Lea, Robert (17 October 2017). "Big Order for Bombardier Train Unit". The Times (72356). p. 43. ISSN 0140-0460. ^ "First D-Trains lined up for West Midlands Trains in 2018". Rail (UK). PressReader.com. 20 December 2017. Retrieved 16 January 2018. ^ "Bombardier and CAF win West Midlands train contracts". Railway Gazette International. 17 October 2017. Retrieved 17 October 2017. ^ a b c "Abellio, JR East and Mitsui announce £680m new trains for the next West Midlands Rail Franchise 413 electric and diesel carriages to be manufactured by Bombardier and CAF". Abellio. Abellio. Retrieved 19 October 2017. ^ "West Midlands Trains" (PDF). Stourbridge Line User Group. Retrieved 17 October 2017. ^ Clinnick, Richard. "Vivarail Class 230s for LNWR delayed until 2019". RAIL. RAIL magazine. Retrieved 21 November 2018. ^ a b Jones, Tamlyn. "Over 100 new trains West Midlands trains – with wi-fi and speeds up to 110mph". Birmingham Post. Birmingham Post. Retrieved 19 October 2017. The West Coast Main Line is one of the most important railway corridors in the United Kingdom, connecting the major cities of London, Glasgow and Manchester. It is one of the busiest mixed-traffic railway routes in Europe, carrying a mixture of intercity rail, regional rail, the core route of the WCML runs from London to Glasgow, with branches diverging to Birmingham and Liverpool, totalling a route mileage of 700 miles. Services from London to North Wales and Edinburgh run via the WCML and it is one of the busiest freight routes in Europe, carrying 40% of all UK rail freight traffic. The line is the rail freight corridor linking the European mainland through London and South East England to the West Midlands. The line has been declared a strategic European route and designated a priority Trans-European Networks route, other traffic is limited to 110 mph. 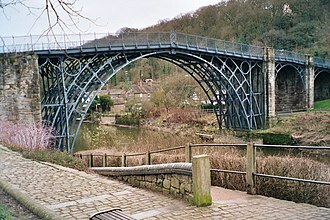 The route between Rugby and Birmingham and Stafford was the main line until the Trent Valley Line was built in 1847. A further branch at Carstairs links Edinburgh to the WCML, providing a connection between the WCML and the East Coast Main Line. This legacy means the WCML has limitations as a main line, with lower maximum speeds than the East Coast Main Line route. The WCML was not originally conceived as a trunk route. After the completion of the successful Liverpool and Manchester Railway in 1830, and so this is how the early stages of the WCML evolved. 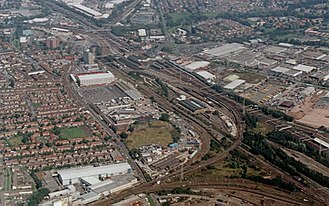 The first stretch of what is now the WCML was the Grand Junction Railway connecting Liverpool and Manchester to Birmingham, via Crewe, the following year the London and Birmingham Railway was completed, connecting to the capital via Coventry and the Watford Gap. 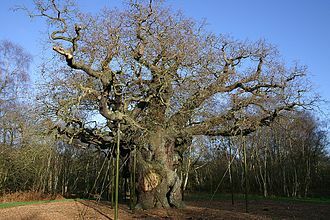 Three other sections, the North Union Railway, the Lancaster and Preston Junction Railway, another important section, the North Staffordshire Railway, which opened its route in 1848 from Macclesfield to Stafford and Colwich via Stoke-on-Trent remained independent. 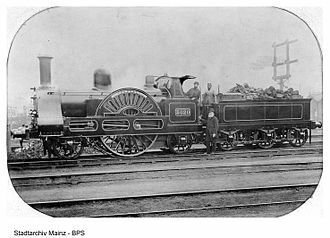 Poor relations between the LNWR and the NSR meant that trains did not run until 1867. The route to Scotland was marketed by the LNWR as The Premier Line, because the cross-border trains ran over the LNWR and Caledonian Railway, through trains consisted of jointly owned West Coast Joint Stock to simplify operations. Mitsui Group is one of the largest keiretsu in Japan and one of the largest corporate groups in the world. The major companies of the group include Mitsui & Co, Sumitomo Mitsui Banking Corporation, Sapporo Breweries, Toray Industries, Mitsui Chemicals, Isetan Mitsukoshi Holdings, Sumitomo Mitsui Trust Holdings, Mitsui Engineering & Shipbuilding, Mitsui O. S. K. Founded by Mitsui Takatoshi, who was the son of a shopkeeper in Matsusaka. From his shop, called Echigoya, Mitsui Takatoshis father originally sold miso, the family would open a second shop in Edo. Takatoshi moved to Edo when he was 14 years old, sent back to Matsutaka by his brother, Takatoshi waited for 24 years until his older brother died before he could take over the family shop, Echigoya. He opened a new branch in 1673, a large gofukuya in Nihonbashi and this genesis of Mitsuis business history began in the Enpō era, which was a nengō meaning Prolonged Wealth. In time, the division separated from Mitsui, and is now called Mitsukoshi. Traditionally, gofukuyas provided products made to order, a visit was made to the customers house, the system of accountancy was called margin transaction. Mitsui changed this by producing products first, selling them directly at his shop for cash, at the time, this was an unfamiliar mode of operation in Japan. Even as the shop began providing dry goods to the government of the city of Edo, at about this time, Edos government had struck a business deal with Osaka. 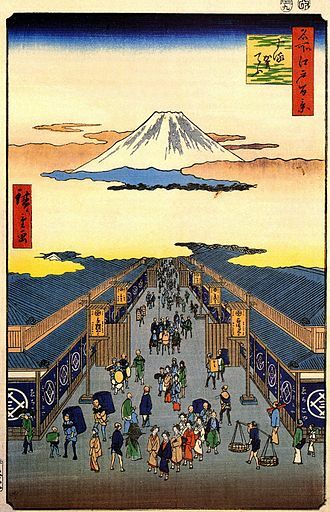 Osaka would sell crops and other material to pay its land tax, the money was sent to Edo—but moving money was dangerous in middle feudal Japan. In 1683 the shogunate granted permission for money exchanges to be established in Edo, the Mitsui exchange shops facilitated transfers and mitigated that known risk. After the Meiji Restoration, Mitsui was among the enterprises that could expand to become not simply because they were already big. Mitsuis main business in the period were drapery and trade. The diversification was made mainly into related fields to take advantage of accumulated capabilities, for instance, on July 1,1876, Mitsui Bank, Japans first private bank, was founded with Takashi Masuda serving as president. Hemel Hempstead railway station is on the West Coast Main Line, on the western edge of the town of Hemel Hempstead, England. The station is 24 1⁄2 miles north-west of London Euston on the West Coast Main Line, Hemel Hempstead is managed by London Midland and all train services are operated by London Midland and Southern. One of two stations now serving the town, the other being Apsley, this one is in an area called Boxmoor. Both were built when Hemel Hempstead was still small, before it was designated a New Town in 1946, bus services run from there to the town centre. Also in the vicinity of the station are two pubs and the Grand Union Canal, about 110 yd away, there are four full-length through platforms and one disused south-facing bay. Hemel Hempstead station was opened by the London and Birmingham Railway on 20 July 1837, the decision to locate the station 1 mile outside Hemel Hemsptead town centre was a result of the opposition faced by the L&BR during construction of the line. 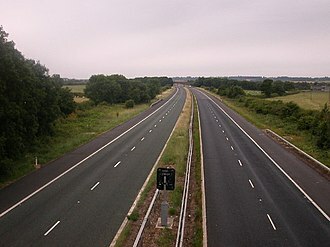 In order to obtain Parliamentary approval, the L&BR was forced to choose a route which was less favourable to Hemel Hempstead. In 1846 the L&BR was taken over by the London and North Western Railway, in 1912 the LNWR renamed the station Boxmoor and Hemel Hempstead. The line was opened in 1877 by the Midland Railway and extended to transport coal to Duckhall gasworks, close to Boxmoor. Only occasional freight trains ran this far, passenger trains terminated in the centre at Heath Park Halt. Passenger services ceased on the Nickey Line in 1947 although it remained in use as a goods line and it was only in the last months of the Nickey Lines operations that a rail link was built at Boxmoor. 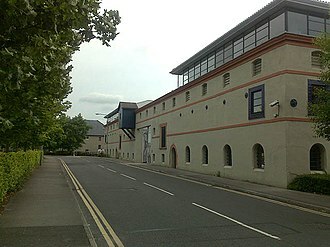 Hemel Hempstead had been designated as a New Town and the town centre redevelopment plans included the demolition of the Nickey Line. In order to maintain a service to the gasworks, a link was built in 1959 connecting the Nickey Line to the West Coast Main Line via sidings at Boxmoor. This link was for trains only and no passenger service was ever provided, but it only remained in operation for six months, the gasworks shut down. The following year the railway viaduct over Marlowes in the centre was demolished. Birmingham New Street is the largest and busiest of the three main railway stations in the city centre of Birmingham, England. 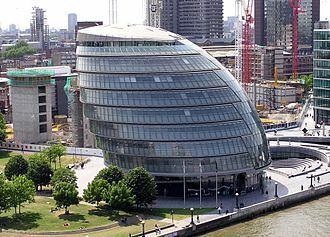 It is a hub of the British railway system. The station is named after New Street, which runs parallel to the station, historically the main entrance to the station was on Stephenson Street, just off New Street. Today the station has entrances on Stephenson Street, Smallbrook Queensway, Hill Street, New Street is the seventh busiest railway station in the UK and the busiest outside London, with 39 million passenger entries and exits between April 2015 and March 2016. It is the busiest interchange station outside London, with over 5.8 million passengers changing trains at the station annually, the original New Street station opened in 1854. At the time of its construction, the station had the largest single-span arched roof in the world, In the 1960s, the station was completely rebuilt. An enclosed station, with buildings over most of its span and passenger numbers more than twice those it was designed for, a £550m redevelopment of the station named Gateway Plus opened in September 2015. It includes a new concourse, a new facade. Around 80% of train services to Birmingham go through New Street, the other major city-centre stations in Birmingham are Birmingham Moor Street and Birmingham Snow Hill. 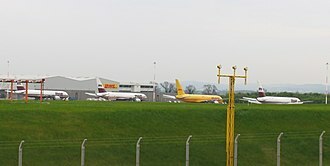 On the outskirts, closer to Solihull, is Birmingham International, which serves Birmingham Airport and the National Exhibition Centre. Since 30 May 2016, New Street has been served by the Midland Metro tram line, the Grand Central New Street Station tram stop is located outside the stations main entrance on Stephenson Street. New Street station was built by the London and North Western Railway between 1846 and 1854, until 1885 the LNWR shared the station with the Midland Railway, whose trains used the station. However, in 1885 the Midland Railway opened its own alongside the original station for the exclusive use of its trains. The two companies stations were separated by a roadway, Queens Drive. Traffic grew steadily, and by 1900 New Street had an average of 40 trains an hour departing and arriving, rising to 53 trains in the peak hours. A logo is a graphic mark, emblem, or symbol commonly used by commercial enterprises and even individuals to aid and promote instant public recognition. There are purely graphic emblems, symbols and logos, in the days of hot metal typesetting, a logotype was one word cast as a single piece of type. By extension, the term was used for a uniquely set. At the level of communication and in common usage, a companys logo is today often synonymous with its trademark or brand. The arts were expanding in purpose—from expression and decoration of an artistic, storytelling nature, to a differentiation of brands and trades-groups in the commercial arts were growing and organizing, by 1890, the US had 700 lithographic printing firms employing more than 8,000 people. Artistic credit tended to be assigned to the company, as opposed to the individual artists who usually performed less important jobs. Playful children’s books, authoritative newspapers, and conversational periodicals developed their own visual and editorial styles for unique, as printing costs decreased, literacy rates increased, and visual styles changed, the Victorian decorative arts led to an expansion of typographic styles and methods of representing businesses. A renewal of interest in craftsmanship and quality provided the artists and companies with a greater interest in credit, leading to the creation of unique logos and marks. By the 1950s, Modernism had shed its roots as an artistic movement in Europe to become an international, commercialized movement with adherents in the United States. Modernist-inspired logos proved successful in the era of mass visual communication ushered in by television, improvements in printing technology, the current era of logo design began in the 1870s with the first abstract logo, the Bass red triangle. As of 2014, many corporations, brands, agencies, as a result, only a few of the thousands of ideograms in circulation are recognizable without a name. Ideograms and symbols may be effective than written names, especially for logos translated into many alphabets in increasingly globalized markets. For instance, a written in Arabic script might have little resonance in most European markets. By contrast, ideograms keep the general nature of a product in both markets. In non-profit areas, the Red Cross exemplifies a well-known emblem that does not need an accompanying name, the red cross and red crescent are among the best-recognized symbols in the world. East Japan Railway Company is a major passenger railway company in Japan and one of the seven Japan Railways Group companies. 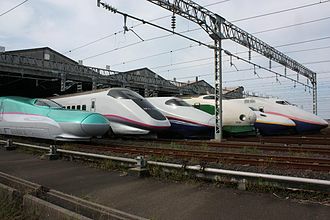 The company name is abbreviated as JR-EAST or JR East in English. The companys headquarters are in Yoyogi, Tokyo, JR East was incorporated on 1 April 1987 after being spun off from the government-run Japanese National Railways. Following the breakup, JR East ran the operations on former JNR lines in the Greater Tokyo Area, the Tohoku region and its railway lines primarily serve Kanto and Tohoku regions, along with adjacent areas in Koshinetsu region and Shizuoka prefectures. JR East operates all of the Shinkansen, high-speed rail lines and these lines have sections inside the Tokyo Suburban Area designated by JR East. This does not necessarily mean that the lines are fully inside the Greater Tokyo Area, JR East aims to reduce its carbon emissions by half, as measured over the period 1990-2030. This would be achieved by increasing the efficiency of trains and company-owned thermal power stations, the Tokyo Metropolitan Police Department has stated that JR Easts official union is a front for an organized crime syndicate called the Japan Revolutionary Communist League. Crewe railway station is a railway station in Crewe, England. The station was completed in 1837 and is one of the most historic railway stations in the world, Crewe was chosen after Winsford, seven miles to the north, had rejected an earlier proposal, as had local landowners in neighbouring Nantwich, four miles away. Crewe is a junction on the West Coast Main Line. It is 158 miles north of London Euston and 243 miles south of Glasgow Central, Crewe railway station has twelve platforms and a modern passenger entrance containing a bookshop and ticket office. Passengers access the platforms via a footbridge and lifts, the platforms buildings dating from the 19th century contain two bookshops, bars and waiting rooms. The last major expenditure on the station was in 1985 when the layout was remodelled. Crewe station was the first station to have its own adjacent railway hotel, The Crewe Arms, built in 1838 and it was the first to be completely rebuilt owing to the need for expansion. It was the first to have completely independent rail lines built around it to traffic congestion. The station opened on 4 July 1837 on the Grand Junction Railway, the purpose was to link the four largest cities of England by joining the existing Liverpool and Manchester Railway with the projected London and Birmingham railway. The station was built in the township of Crewe, which formed part of the ancient parish of Barthomley. The township became a parish in its own right, still, was renamed Crewe Green to avoid confusion with the town of Crewe. The station was at the point where the line crossed the road linking the Trent and Mersey. Since the land was bought from the Earl of Crewe, whose mansion stood nearby, and it was located in the township of Crewe, the railway station gave its name to the town of Crewe that was actually situated in the ancient parish of Coppenhall. In 1936, the station was transferred from the civil parish of Crewe to the municipal borough of Crewe. As soon as the station opened the Chester and Crewe Railway was formed to build a line to Chester. In 1842 the GJR decided to move its works from Edge Hill in Liverpool to Crewe. MTR Corporation Limited is a company listed on the Hong Kong Exchange, and a component of Hang Seng Index. MTR runs Hong Kongs Mass Transit Railway, and is a property developer. It invests in railways in different parts in the world, and has obtained contracts to operate rapid transit systems in London, Beijing, Hangzhou and Sydney. The Mass Transit Railway Corporation was established in 1975 as a statutory corporation to build. On 30 June 2000 the MTRC was succeeded by the MTR Corporation Limited, as with the MTRC, the MTRCLs principal business is to operate the mass transit railway system. Following a successful public offering, the MTRCL was listed on the Hong Kong Stock Exchange on 5 October 2000. On 11 September 2000, the Financial Secretary of the Hong Kong Government, Mr Donald Tsang, the offering was for one billion shares, but this was increased to 1.15 billion due to high demand. On 5 October 2000, the company was listed on the Hong Kong Stock Exchange with 600,000 shareholders, in June 2001, MTR was added to the Hang Seng Index. At the time of the public offering, the company was operating with a budget surplus of HK$360 million. 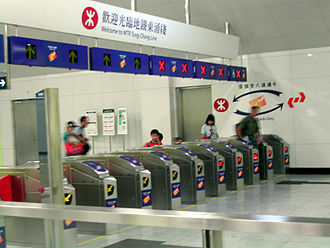 The MTR has continued to be one of the few public transport systems in the world. There had been discussion of merging the Kowloon–Canton Railway Corporation, which was government-owned. The MTRCL backed such a merge while the KCRC opposed the plan, in March 2004, the Hong Kong Government officially encouraged the two companies to merge. On 11 April 2006, the Hong Kong Government officially announced the details of the proposed merger, in addition, MTRCL would make a payment of $7.79 billion for the acquisition of property and other related commercial interests. The railway lines the KCRC operated were less profitable than the MTRC, and it was widely considered that the Governments choice was to avoid being criticised for selling assets of the KCRC, which it wholly owned to MTRCL at an underpriced level. Leasing the operation right of the KCR system to the MTRCL could avoid actually selling the KCRC, on 2 December 2007, the Chinese name of the MTRCL was changed to 香港鐵路有限公司 after being granted the Service Concession while the English name will remain unchanged. Milton Keynes Central railway station serves Central Milton Keynes and the surrounding area of Milton Keynes, England. The station is located on the West Coast Main Line between the stations of Bletchley and Wolverton, both of which are within Milton Keynes, the station is served by Virgin Trains intercity services, and by London Midland and Southern regional services. This station is one of the five stations serving Milton Keynes, the others are Wolverton, Fenny Stratford and Bow Brickhill. In addition, Woburn Sands railway station is just outside the Milton Keynes boundary, the station was opened by British Rail on 14 May 1982 in an official ceremony with full public opening three days later. Before it opened, Bletchley railway station was the station for Milton Keynes. These services moved to the new station, downgrading Bletchley, in May 2006, the Department of Transport announced a plan to upgrade the station. The first phase added a down fast line platform 6, so that the existing platform 5 could be used for stopping trains in either direction. The second phase provided an additional terminating bay platform, nominally to extend the Marston Vale Line Bedford/Bletchley service via the WCML to Milton Keynes Central and this 5-car bay platform is indented into platform 1. The original platform 1 line was extended northwards from bay to through and this work was completed on 29 December 2008. As of 2014, a service between Bedford and Milton Keynes is not in any published plan, being overtaken by events. Milton Keynes Central has a total of seven platforms, platforms 1 and 3 are the south and northbound slow platforms, while 4 and 6 are the south and northbound fast platforms. Platforms 2 and 5 are reversible, being slow and fast respectively, platform 2 is used by terminating services from London Euston and East Croydon, whilst platform 5 is used by London Midland services to Birmingham New Street and Crewe. Platform 2A is a five-car south-facing bay platform originally intended for the extension of Marston Vale Line services into Milton Keynes Central and this proposal no longer appears in plans for the East West Rail Link, being replaced by a planned service to/from Oxford. Tring railway station is 1.5 miles outside the small town of Tring, close to the Grand Union Canal and actually nearer the village of Aldbury in Hertfordshire, England. Situated on the West Coast Main Line, the station is now an important marshalling point for trains from here for most stations to London Euston. There are five full length platforms, with one side platform, to the east of the station are some south facing sidings connecting to the slow lines. Tring station was opened by the London and Birmingham Railway on 16th October 1837 when the L&BR extended its line out of London beyond Boxmoor to Tring. The first train to Tring ran from Primrose Hill at 9,00 am on 16 October 1837, on 15 November 1844, Queen Victoria and Prince Albert made their first train journey north from Euston, reaching Tring in 52 minutes where the train stopped to take on water. Despite rain, the appearance of the royal train attracted crowds of farm labourers and local children and it is reported the after this stop, Victoria asked that the speed of her train be reduced. The L&BR was constructed by the railway engineer Robert Stephenson and he did, object to a much plan to build a steam tramway between Tring Station and Aylesbury. Tring stations distance from the town would have been greater had the L&BR placed the station at Pitstone Green, some 3 miles further north, Tring station originally intended as a destination of a branch of the Metropolitan Railway. A short section of the branch from Chalfont and Latimer to Chesham was built in 1887-89 before the MR chose to construct a route across the Chilterns via Aylesbury instead. Tring lies on a commuter route into central London and most West Coast Main Line train services run directly into London Euston. It is the terminus of many slower London Midland trains out of Euston and it is served by an hourly cross-London service which runs via the West London Line to serve stations in South London. The typical off-peak services in each direction are, Mondays-Saturdays 3 trains per hour to London Euston, of which,1 is fast, calling at Berkhamsted, Hemel Hempstead and Watford Junction only. The northern WCML as it weaves through the Lune Gorge in Cumbria alongside the M6 Motorway. Watford Locomotive Depot 27 January 1951. London Midland service at Northampton in 2012 prior to rebuilding. 1900s postcard of the exterior of Castle station. Castle to Bridge Street ticket from 1957. Harrow and Wealdstone station, with the DC electric platforms to the left, and main line fast platforms to the right. A Southern class 377 arrives at Hemel Hempstead with a Milton Keynes Central to East Croydon service, August 2010. Northward view showing the track curvature.